How to open XLSX file without any problems? You are here: CoolUtils > Total Mail Converter > How to open XLSX file without any problems? There are a lot of commercial mail converters available that can convert MSG to PDF. 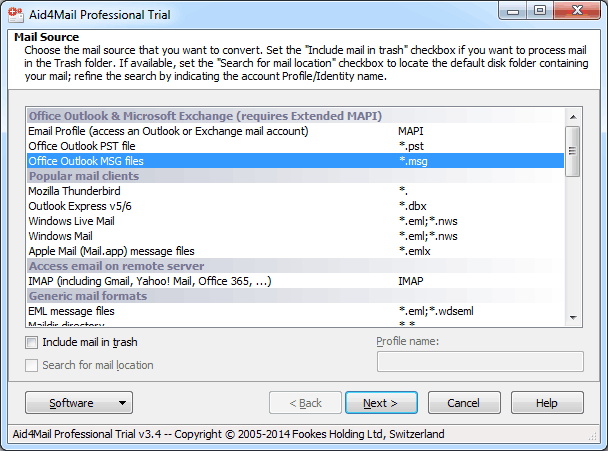 Two of them, Aid4Mail and Total Mail Converter are reviewed below. Testing was performed by a user not experienced in mail conversions, both programs were tried for the first time. For equal comparison, both programs are taken in commercial licenses. Both versions can be downloaded in trial and tested for free. The installation of both programs is pretty standard. Users need to specify location, agree to Terms and Conditions and follow the instructions. It is much more interesting what happens next. At first Aid4Mail offers to select a mail source format. If you are not sure in what mail client the original mail files were created, this can be a problem. You need to know, in what program your files were made (Office Outlook, Mozilla Thunderbird, Windows Live Mail, Eudora, etc.) For instance, we tested a folder with 10 .msg files. We specified ‘Office Outlook MSG files’. Aid4Mail didn’t recognize those MSG files showing that the folder is empty untill we selected 'Generic EML files'. Somewhat cumbersome. 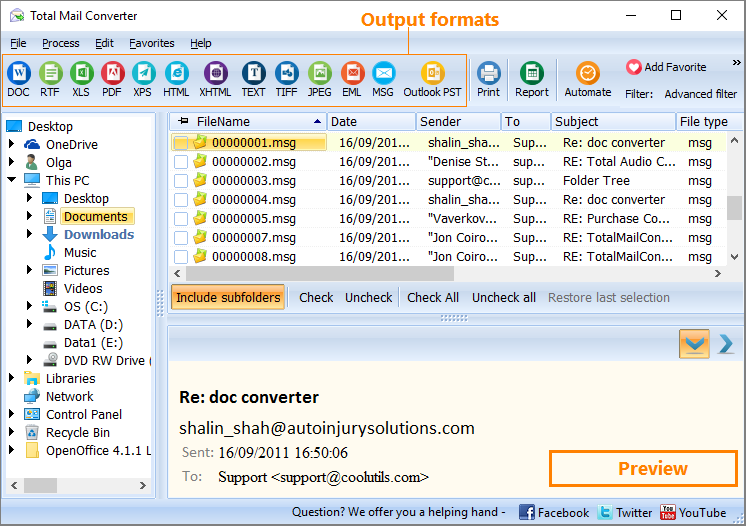 Total Mail Converter Pro from CoolUtils is slightly easier to start with. Files browser is integrated into the program window, user can press on any memory folder and see what files it contains. Supported source formats are – MSG, EML, EMLX, MIM. Users are not required to specify the program that created the MSG files. So if you have just some MSG files, the program will process them. MSG to PDF, what else? 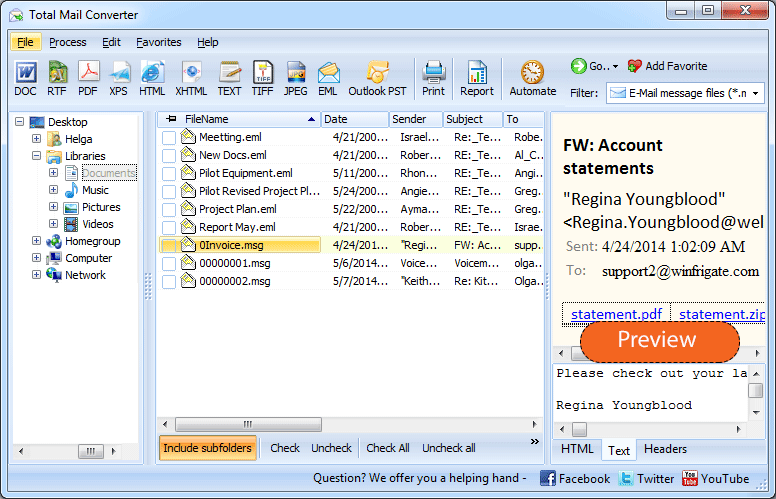 Aid4Mail can export MSG to PDF, as well as MHT, CSV or XML. 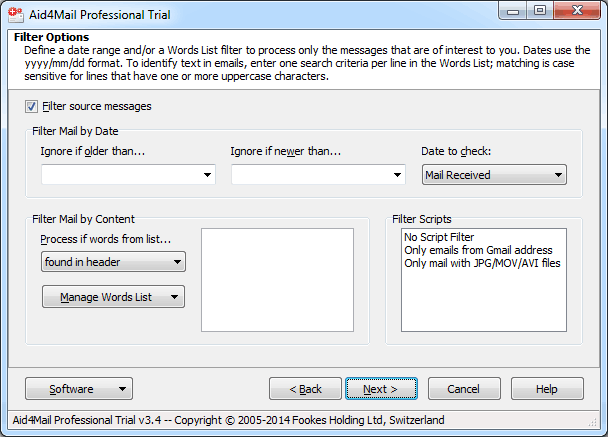 Additionally it can export messages to Office Outlook PST, Mozilla Thunderbird, SeaMonkey Mail, and many other email programs. So Aid4Mail is great for migrating between two email clients. Total Mail Converter can export mails to PDF, DOC, TXT, XLS, XPS, HTML, XHTML, TIFF, JPEG. Additionally it can export MSG files to PST. Among mail formats MSG/EMLX/MIM/EML conversion is supported. Total Mail Converter is better for conversion of MSG files to non-mail formats. Both programs are batch MSG converters. However, if you have thousands of .msg files in yout folders, it's crucial to have a flexible filtering option. After specifying mail source type and location in Aid4Mail, you will be asked to filter source emails by date or wording. You can also check if you wish to convert only received, sent or stored mails. In Total Mail Converter users can only sort MSG files in the current folder by name, date, sender, subject, header, modify date, sender ip, file size and then check those emails that they want to process. Set document properties (author, keywords, subject, title). 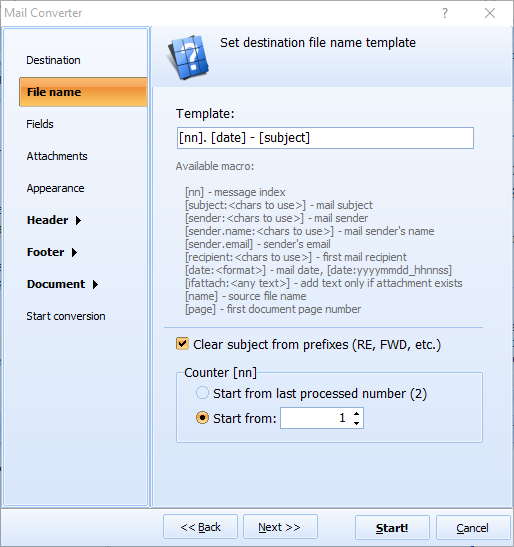 Aid4Mail only offers to extract mail attachments in their native format. You will get a file with the links to attachments. And what is strange, you cannot convert emails to target format and extract attachments at the same time. You can do only one thing at a time. 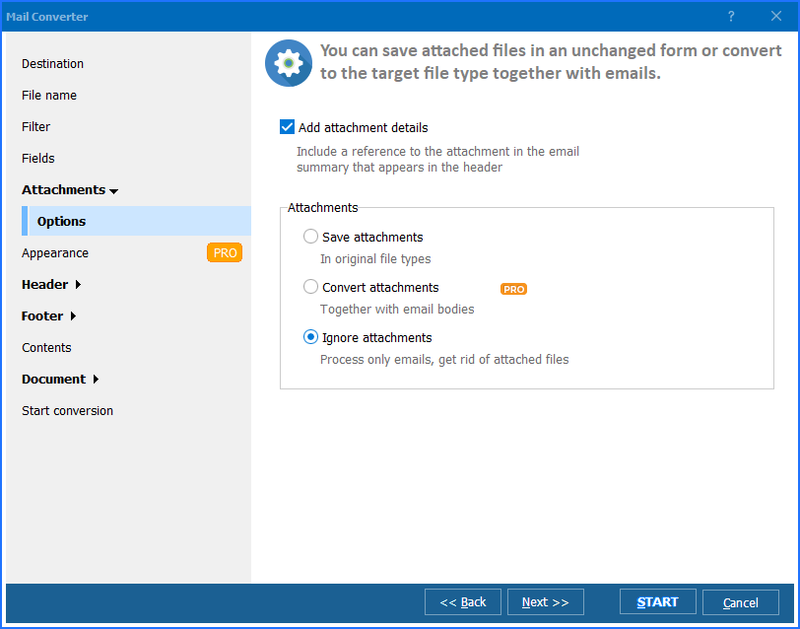 Total Mail Converter Pro can extract attachments in native format, convert attached messages and documents to a target format, insert attached images into a converted mail copy, unzip archives. In this sense Total Mail Converter is more functional. Aid4Mail costs $59.95 for 1 year subscription. You can get 50% discount on renewal. The trial version is free (for evaluation purposes only). Download. Total Mail Converter costs $59.90, a life-time license. The free trail version is valid for 30 days. Download. The quality of conversion is excellent in both cases: no lost data, no unreadable characters, etc. Both converters can be used from the command line. However, the range of supported formats is different as well as the list of additional options. The best choice depends on your purpose. If you need to import mails from one email client to another, Aid4Mail fits better. If your MSG or EML files need to be exported to PDF or text docs, images or web-pages for comfortable reading, editing and sharing, it's better to choose Total Mail Converter.